At Dr. Energy Saver Of Connecticut, we are dedicated to helping people increase their comfort at home while decreasing their utility bills up to 30%. We solve comfort and energy problems, including inadequate insulation, which is one of the most common issues homes face. While we are a full-service insulation contractor, we believe that spray foam is the best bang for your buck insulation service available due to how well is seals even the most difficult of areas in your home, and how quickly you will see a return on your investment from the energy savings. Many homeowners are choosing spray foam insulation because of its unique qualities. There are different types of spray foam (explained below), but the main type is known as Spray Polyurethane Foam, or SPF. When you consider the advantages of SPF, you may want to put this advanced insulation to work at your house. If you are interested in increasing the comfort or your home while decreasing your energy bills up to 30%, contact the experts at [comapny] for a FREE Spray Foam Insulation Estimate today! We install spray foam in homes in Norwalk, Danbury, Stamford, Greenwich, New Haven, Hartford, Darien, New Canaan, Westport, West Hartford, Ridgefield, Hamden, and all surrounding areas of Connecticut and Westchester County, NY. Get a FREE Spray Foam Insulation Quote! Superior R-value. SPF (Spray Polyurethane Foam) is rated at R-6.2 per in. or more --higher R-value than any other type of home insulation. Complete coverage. SPF expands after application, effectively filling voids and odd-shaped spaces. With spray foam, you always get total coverage. Effective air barrier. SPF isn't just a high-performance thermal barrier; it also stops air leakage, making it doubly effective at saving energy. Waterproof and stable. SPF won't absorb moisture and lose R-value like fiberglass can. It won't compress, settle or fall out of place, either. We hired Dr. Energy Saver CT because of the experiences we've already had with the Total Basement Finishing & Connecticut Basement Systems. I've already recommended friends and family. The crew who preformed the work in my Fairfield home were very professional, polite and respectful. The installation of the work in my home was pleasant experience from beginning to end! I also enjoyed my salesman's personality and honesty. I will highly recommend you. Thank you! Dear Mr. Janesky, I would like to bring to your attention the excellent job that your two employees, Johnny Lopez and Rafael Quechotl, did at our home on May 24th. They were both knowledgeable and professional and went way beyond expectations in all phases of the hob. Most importantly, they were extremely meticulous in cleaning up after a very messy (mouse infested) insulation removal project. You are very fortunate to have them as a part of your team. Thank you. We were referred to Dr Energy Saver by our daughter, they came out and were able to address our basement water issue at our home in Hamden. We are so pleased with the crew who installed our job. They were pleasant and easy to talk to and very helpful. The crew took special care with our furniture by covering it in plastic when needed while working in our basement. Amazed at the great job that was done and how clean everything was after they were done. Guys were amazing! The top reasons I hired Dr. Energy Saver is for the foam insulation which offered a better R-value and to have a better comfort zone. Hello Larry, I want to share with you an important factor in my life, “MY FAMILY”. In the year 2012 I was deployed with my military police k9 unit. It was unfortunate that the same year my family endure some extreme bad weather, I felt helpless, incapable of providing my family a safe and comfortable home. During Hurricane Sandy, my Basement flooded and in the winter my family experienced intense cold. In my return, I dedicated myself to find a solution to my family’s safety and comfort. I researched the internet for all kinds of “do it yourself” opportunities; I was not impressed with any of it. Until, I saw your video on the net. You demonstrate such passion and care about your product that I thought your work must have impeccable quality. I was right. I called The Basement Systems to schedule a consultation, after a few hours I had peace of mind knowing that your company can provide a solution for my basement. Your employees were great from the salesperson to the contractors. The work was only two days which was amazing to me, I am happy with the work done. The following week I had the greatest pleasure to work with your sister company Dr. Energy Saver. I received the most amazing customer service from the sales person Paul Zambrano to the Foreman Eric Ardito, Bobby, and Miguel. Every day I heard my family speaking highly of the guys. They were courteous, professional, and efficient. I had planned to find a way to replace my bathroom because of the possibility of my tiles braking off. The guys did not even crack one tile in two bathrooms. They work so well dismantling the chimney, I was extremely amazed. My entire house feels warm and safe all thanks to your product and your employees. Rest assure that I will always refer your business to everyone.I am grateful for the work done in my house. Thank you. Gabriel RosarioA happy customer. 1-part foam: A commonly used type of spray foam insulation, this type of spray foam, comes in pressurized cans that are sold at home centers and hardware stores under brand names like GREAT STUFF™. This single-component foam is super-sticky, and expands at different rates (depending on the type you buy) immediately after application. Since it seals gaps as well as insulates, this product is often referred to as an "insulating foam sealant." 2-part foam: To insulate an entire basement or attic with spray foam, contractors use 2-part Spray Polyurethane Foam (SPF) that comes in a pair of pressurized metal containers. When both components (resin and a catalyst) are mixed together at the nozzle, a foaming chemical reaction takes place that causes the material to expand. This allows us to thoroughly insulate hard to reach spaces and offers greater air sealing capabilities. If you are unsure what the best spray foam insulation for your home would be, contact us today, we would love to help! Contact us today for a Free Estimate-- we are your trusted spray foam insulation contractor serving Hartford, New Haven, Greenwich, Norwalk, Danbury, Stamford, Cheshire, Milford, Trumbull, Shelton, Bridgeport, Waterbury, New Britain, Bristol, Meriden, Glastonbury, Monroe, Stratford and more. We have years of experience insulating houses with spray foam insulation. 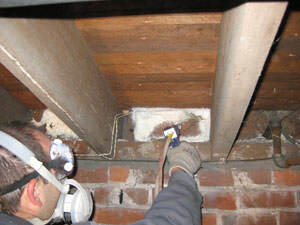 From the attic to the crawl space and all the drafty spaces in between (knee wall spaces, garages, windows), we have a range of insulation solutions and effective techniques to make your home comfortable and efficient! We also offer a comprehensive home energy evaluation to diagnose the major contributors to your home's energy issues. A home energy evaluation is the best place to start if you are experiencing drafts or uncomfortable temperatures. We'll be able to pinpoint the exact source of your concerns and provide the solutions!